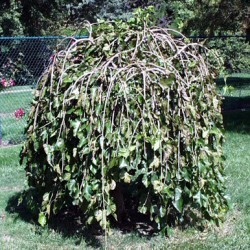 An interesting tree ideal for a small garden, as it only reaches a height of 6m (20ft), this is a weeping form of the popular black mulberry. Mis-named in our opinion as it bears delicious, edible, black mulberries. The leaves on this tree are a large pale-green colour, turning yellow during Autumn. We have found that it does well in any well drained soil and prefers either a full sun or partial sunny position. As a point of interest, this tree is used for the cultivation of silk worms. This tree is supplied at a height of 150 - 200cm in a 7 - 12 litre container, which means that the tree can be planted any time of the year and with better results than either bare-root or root-balled trees. August 2013: Thank you VERY much our tree arrived safely at about 3.30 this afternoon.We have unpacked it and given it a drink and it looks really good. A lovely young tree. Hoping to plant it this evening. Thank you very much indeed - we are truly pleased with the Mulberry tree. Rosalyn O.